Which is not to say that Summer of the Ubume is in any way like the Harry Potter series, aside from its sheer literary addiction quotient. On the surface, the book presents a simple “sealed room” murder mystery. Underneath, however, is mystery upon mystery upon mystery. Running through these mysteries is a current of Japanese folklore, especially folklore concerning spirit possession. The “ubume” of the title is the ghost of a woman who died in childbirth and carries out her grudge against still-living mothers by stealing their infant children. This trope is connected to the household of a family that is just about as gothic as they come, with frail maidens and hereditary curses and hidden murders set on the stage of an almost abandoned hospital, which was designed by an insane architect and almost destroyed during the wartime firebombing of Tokyo. The Summer of the Ubume is set in 1952 in the Nakano area, which used to be a residential district on the northwest periphery of Tokyo, a stone’s throw away from the prisons, insane asylums, and black markets of Ikebukuro. Its narrator is a man in his early thirties named Sekiguchi, a freelance writer who specializes in essays on supernatural incidents. Sekiguchi is friends with the brilliant yet antisocial proprietor of the Kyōgokudō used bookstore (which is the name his friends use to refer to him). Sekiguchi is the Watson to Kyōgokudō’s Holmes, and a great deal of the book is devoted to their conversations concerning metaphysical matters, which end up having a great deal to do with the mystery at hand. In the course of his work (which borders on yellow journalism), Sekiguchi has stumbled upon a rumor of a woman who, having been mysteriously deserted by her husband, has been pregnant for eighteen months. After asking several magazine editors about the source of the rumor, Sekiguchi becomes more intrigued. Due to a strange series of coincidences, the writer has the opportunity to meet the woman’s family, which is deeply dysfunctional in every possible way. As Sekiguchi learns more about these people, it turns out that his ties to them are deeper than he initially suspected. The first chapter of the novel is a forty-page discussion of the supernatural between Kyōgokudō and Sekiguchi. 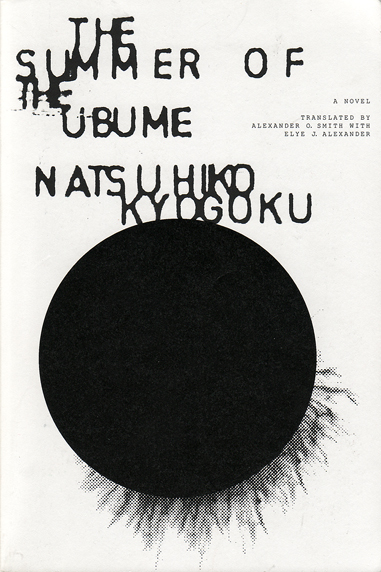 Each page is dense with ideas and metaphysical language (not to mention text – the book’s margins are practically nonexistent), and neither Sekiguchi nor Kyōgokudō is presented in a particularly sympathetic light – Sekiguchi comes off as rather dense while Kyōgokudō is supremely abrasive. If the reader can weather this initial chapter, however, he or she will be rewarded with a deliciously convoluted mystery populated by a genuinely fascinating cast of characters. The action of the story reaches its climax 230 pages into the novel, which leaves 90 pages for the explanation of the mystery. Although this may seem like poor pacing, the explication is well-plotted, engrossing, and bizarre, reaching its own climax at the end of the novel. The Summer of Ubume is Kyōgoku’s debut novel, and at times it does feel unpolished. The momentum of the story more than makes up for any flaws in the narrative’s structure, however. The occasional clichés implicit in the mystery (such as the uncertainty that is inevitably created when there are two almost identical sisters in a fictional family) are balanced by the writer’s unique take on the gothic genre. The novel’s setting in 1950’s Tokyo is fully taken advantage of by Kyōgoku, who skillfully renders the city as a sinister gothic landscape. Although, as I mentioned, there is a greater emphasis on talking heads in this novel than is strictly necessary, the characters and setting are superbly handled, and the mystery is just about as addictive as they come. I can only hope that more of Kyōgoku’s work is translated into English as soon as possible. The heavy metal song 眩暈坂 by band 陰陽座 appear to be based on this novel.